Collage seems like such a simple artistic medium. Everyone remembers creating a collage in elementary school using old magazines, scissors, and a lot of glue. In reality, true collage is fairly complex and requires quite a bit of critical thinking. It also happens to be a perfect way to connect with other content areas. While the obvious choice is with vocabulary, using collage to teach math can be even more powerful. 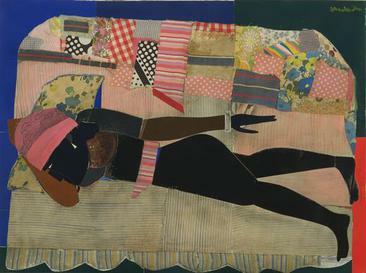 In our upcoming February lesson packs in the IntegratED Curriculum, we’ve taken a deep dive into this concept through the work of Afro-American artist Romare Bearden. Influences for Bearden’s work include Mexican muralists like Diego Rivera and Jose Clemente Orozco. He used his life experiences to guide his work and was also interested in music, history, literature, and was even a social worker for a while in New York City. If you’re looking for more ideas like this without having to recreate the wheel, definitely check out the IntegratED Curriculum. You can subscribe and get lessons like this instantly. As students begin, they must have a deeper understanding of modern collage – both techniques and purpose. One of the resources provided for teachers in this lesson pack is our Collage Resource. We’re including it below for you to use in your own classroom! Once students explore both Bearden’s work and understand collage itself, it’s time to explore the math behind it. As this lesson is for 5th grade, the focus is on equation rules. You can use both addition and multiplication/division rules. The addition rule means that the same quantity can be added to both sides of an equation without changing the solution. The multiplication/division rule says that every term on both sides of an equation can be multiplied or divided by the same term (except zero) without changing the solution. Specifically, 5th graders are tasked with using an equation rule to both analyze Bearden’s work and create their own. For example, students could us the rule # of Plants x (# of Animals + # of People + # of Buildings) for this activity. Collage can be such a meaningful way to explore many different content areas. This activity is just one idea, but it’s a different take on an old classic. Give it a try with your students and see how they reshape their own thinking!